Corey Crawford must be used being under-appreciated at this point. Despite having another stellar regular season and doing all that he could in the postseason for the Chicago Blackhawks, NHL general managers still decided to pass him over on their Vezina Trophy ballots (an award annually given to the best goaltender in the league). The above highlight should be enough to show the rare kind of ability that Crawford brings to the Blackhawks on a nightly basis. Even potential NHL MVP Patrick Kane agrees that Crawford is one of the top goaltenders in the league. Personal bias may play a factor in Kane’s assessment, but remember No. 88 referenced the excellent numbers that Crawford posted in leading Chicago through a host of injuries and controversies during the 2015-16 season. All told, it isn’t inconceivable to say Crawford was the most important player on the Blackhawks roster this season, and that another Vezina Trophy snub for him is both unfair and completely asinine. Not only did he deserve to be a finalist for this prestigious award but he also made a strong case to be considered the best player at his position in the entire NHL. 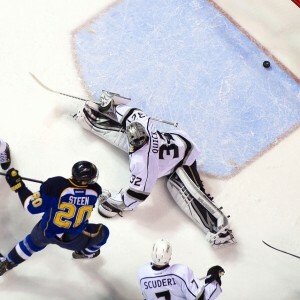 However, he was once again bypassed for this award by inferior candidates, including Jonathan Quick and Braden Holtby – both of whom seemed to earn their nominations based on mainstream reputation rather than their actual performances this season. 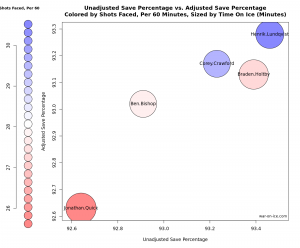 Crawford clearly stands above the competition, whether or not the judges prefer new age adjusted save percentages or more traditional stats (adjusted save percentage is a stat that accounts for the quality of the scoring chance that the goaltender saved on the play, which is typically determined by shot location or puck movement). The following graph does an excellent job of displaying both new and old age stats, and how Crawford compares to the nominees for the Vezina. For the sake of fairness, I also included Henrik Lundqvist as I have previously written that he deserves to be a finalist this season. As a reminder for those that will insist upon disagreeing with this article, these are hard statistical facts being displayed in this graph. If read correctly, one can easily see that Quick was far inferior to Crawford this season despite seeing fewer shots, and still received enough votes to finish amongst the top-3 in Vezina voting. Before anyone rushes to defend Quick’s candidacy, remember that he posted a lower save percentage on low-danger scoring chances than both Kari Lehtonen and Cam Ward this season, while still finishing with a lower save percentage on high-danger chances than Crawford. Meanwhile, Holtby’s 48 wins seem to have blinded GMs to the fact that both Crawford and Lundqvist had higher adjusted save percentages than him. This becomes more important when one breaks down the game of hockey to determine how much of an impact a goalie really has on the stats they are able to put together. Accumulating 48 wins over the course of a season is impressive on the surface, but when the team that goalie plays for scores the second most goals in the league, it becomes easy to see why simply accumulating wins may not be the best way to judge a goalie’s play.